With so many options in a big city like Chicago, where should you go to take your first dance class? In our latest post “Dance Classes Near Me,” Learn about different dance styles, what to consider when looking for a dance studio and the perks of dancing. Are you looking for partner dancing or a style that you can dance on your own. Each dance style listed below is a partner dance. The dance styles we have included are perfect for singles or couples preparing for a special event, or just looking for new hobby in dance. If you don’t have a partner you can dance along with your instructor learning each step. If you have someone interested in attending a dance class with you then you can dance together. In most dance studios, 2 types of services are offered, dance classes and private dance lessons. Salsa – A social dance style popular in Chicago. Salsa dancing opportunities are plentiful in the city of Chicago. Normally most dancing opportunities are sponsored by a Salsa Night. Salsa has several different styles. Salsa on “1”, Salsa on “2”, or Cuban Style Salsa. Both in Madrid and Barcelona they dance mostly Cuban Style Salsa. The numbers refer to the count you dance to the music. In Chicago we dance mostly Salsa on “1”. Mambo, which is a dance style like Salsa, is danced on 2. Bachata – A social dance style popular in latin social dance clubs. Typically a nightclub will play Salsa, Bachata, Merengue, and Cha Cha music. Bachata is danced worldwide. Styling makes Bachata fun to dance. Typically you see different styling techniques for different regions. Waltz – A formal or social ballroom dance that is danced in weddings and special events. Waltz in one of the most traditional dance styles people recognize. Waltz began in Europe and has evolved since its arrival in the United States. There are 2 styles of Waltz, Standard and American Style. Standard Waltz is danced and competed in Europe. There are differences between Standard and American Waltz. In Standard the lead and follow maintain a dance frame through the enitre dance. In American Style Waltz the lead and follow can come apart in to open dance frame. American style has more ability for open choregraphy and freestyle dance moves. Rumba – A formal or social ballroom dance style with a latin flare. Rumba is a great dance style for a first dance or smaller dance floor. Rumba has 2 main styles. American Rumba is competed and the count is slow quick quick. This style is sometime described as dancing rumba with bent knees. International Style Rumba is described like dancing with straight legs. The timing is 234-1. Swing – If you like big band music then East Coast Swing is the dance style for you. There are different styles of Swing Dance referred to as East Coast and West Coast. East coast swing looks similuar to jive and Lindy Hop. West Coast Swing can be danced to many different styles of music. Blues, country, and rock-roll are wonderful dance styles for West Coast. My favorite is dancing West Coast to the blues at Kingston Mines in Lincoln Park. Cha Cha – A formal ballroom dance style or social dance. There are several different styles of Cha Cha. The styles are referred to as Social Cha Cha, American Style Cha Cha, and International Latin Style Cha Cha. Social Cha Cha is typically danced vertically up and down the floor while American Style is danced horizontally. Foxtrot – A jazzy American Smooth dance style or International dance style that can be danced formally or socially. American style foxtrot is danced with Frank Sinatra and old classic music. In the Bronze level of american style foxtrot we close the feet. Try a search on google to see who is near your home Don’t just rely on googles 3 pack listing. Go ahead and dive farther down intro the map. The keywords you searched to find a dance studio may not be bringing the most relevant or closest dance studio to your attention. Google is constantly changing their algorithms which impacts the search on finding a dance studio. Check out the reviews online to see what other dancers have to say. Taking the time to read Yelp reviews will help you gather feedback from consumers. Yelp does a great job of filtering fake reviews and helps show relevant first hand accounts about dance studio’s. Remember to take everything with a grain of salt. As a dance studio owner it is hard to please every client. At the end of the day we are all humans not machines and clients can have a bad day that carries over into their life outside of work. Another great resource is The Knot. The Knot focuses mostly on weddings and will likely feature and showcase the first dance, the father daughter dance and possibly the mother son dance. Get an idea of what there atmosphere is like by checking out their social media pages like facebook and instagram. Dance studios are social and this should be displayed on their social media pages. Check out events and updates about local dance studio’s through these marketing tools. Social media is platform for dance studio’s that help them promote their atmosphere without having to pay some fancy web designer every time they have a dance studio event update. See if they have video or pictures of their school in action. The best way to see what’s happening is to check out visuals and videos. Do you see wedding clients smiling? Does it look like a fun atmosphere. Dance studio have access to more resources than ever before and typically you can check out video’s embedded in their website or facebook page. Most dance studios offer an introductory dance lesson. Remember we all have to start with the basics. Its a great way to give the dance school a try. Sign up for a beginner level class of your choice and then see what you think. Normally a 4 week group class ranges from $40 – $80 dollars. Live in Chicago near River North, South Loop, West Loop, Lake Shore East, Gold Coast or River West? Schedule an appointment our downtown location at 410 S Michigan Ave, Chicago IL 60605. 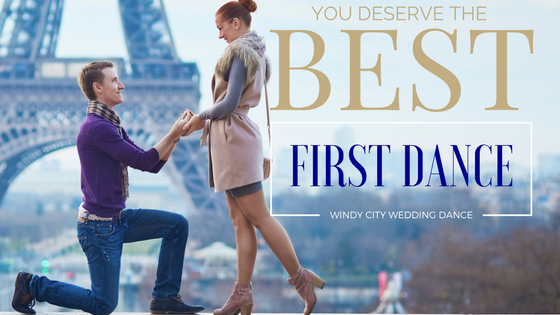 Windy City Wedding Dance offers dance classes and private dance lessons.